Strings of things! Explore our great range of colourful hanging home décor including Fair Trade tota bells, Thai saa paper dangleys, colourful felt strings and amazingly vivid sun catchers. Perfect ideas here for adding a little something to the corner of any room! 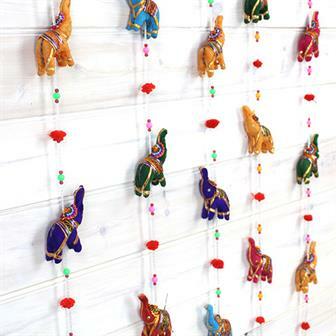 Long string of brightly coloured fabric elephants decorated with golden fabric threads. Has a small bell at the bottom which jangles in the breeze. 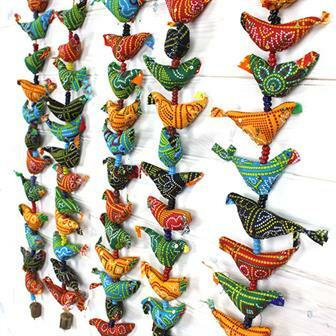 A string of bright rustic fabric birds, decorated a few sequins with black glass beads with a small cow bell attached at the bottom. 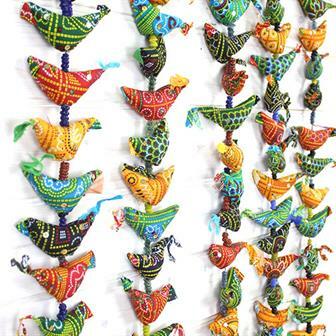 A string of bright rustic fabric birds, decorated with black glass beads with a small cow bell attached at the bottom. 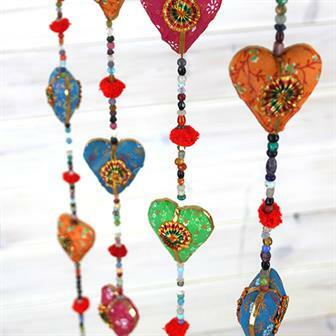 Beautiful vibrant coloured stuffed fabric hearts on string with bright trim and multicoloured beads complete with a rustic cow bell. 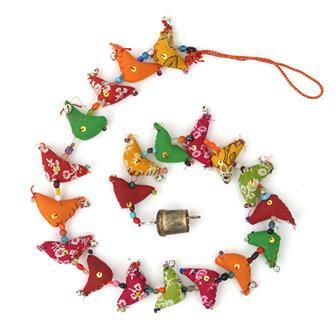 Often known as 'Tota bells' (from the Hindi for parrot,) these wonderfully colourful strings of soft birds have a jangling rustic cowbell at the end. Each one is made from recycled material. 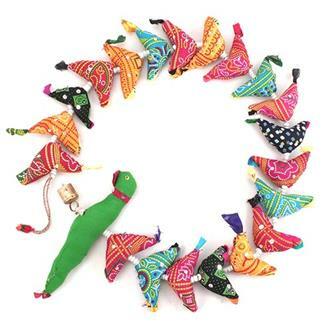 String of mini stuffed fabric sparrows decorated with sequins and tiny jingle bells, each of these delightful rustic birds is spaced with mixed multicoloured beads and the whole thing is finished off with a large rustic bell. 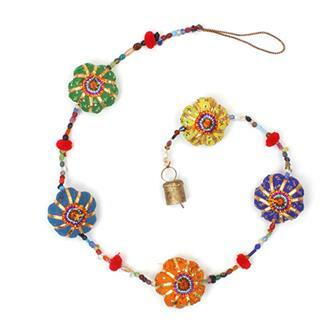 These wonderful Indian dangles are made using five fabric flowers, a myriad selection of little beads and a tinkling bell at the bottom. Perfect for adding brightness and colour to any room of the house! A string of colourful stuffed fabric stars decorated with sparkly material and spaced on a string of tiny colourful beads interspersed with mini pom poms. Each set has a small bell at the bottom which jangles in the breeze. A quintessentially Indian piece of handmade home decor. String of brightly coloured fabric camels decorated with golden fabric threads and suspended on a length of cord decorated with a plethora of mixed multicoloured beads and interspersed with decorative mirror. Complete with a small rustic cow bell and tiny jingles. 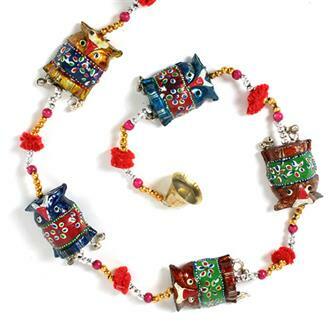 Long string of owl figurines with beads, mini pom poms little jingly bells and a larger brass bell. 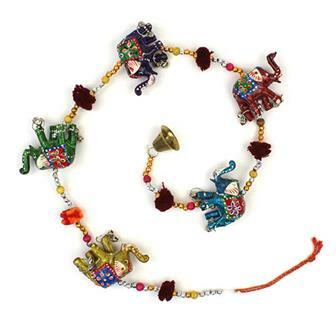 String of hand carved and painted elephants with metallic looking beads, bright pom-poms and a bell. 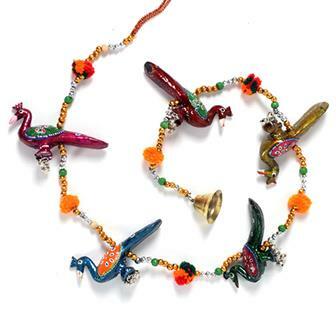 Long string of peacocks figurines with beads, mini pom poms little jingly bells and a larger brass bell. 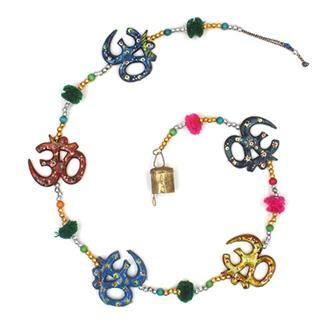 String of decorated Om symbols with metallic beads, bright pom poms and a bell. 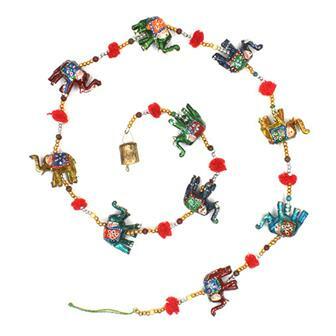 These long strings of ten brightly coloured resin elephants are interspersed with fluffy pom poms and bright little beads. Each one has a small bell at the bottom which jangles in the breeze. 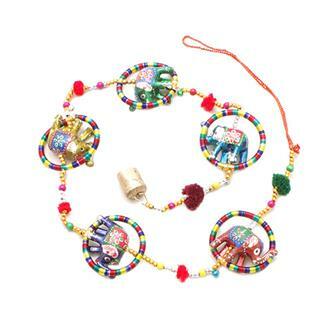 String of little resin elephants decorated with colourful hoops, beads and string. Each string has a small bell at the bottom which jangles in the breeze. 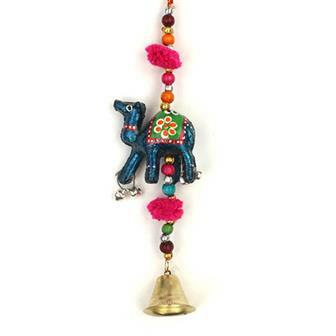 These small hanging resin elephant are painted in bold colours and adorned with little jingly bells. 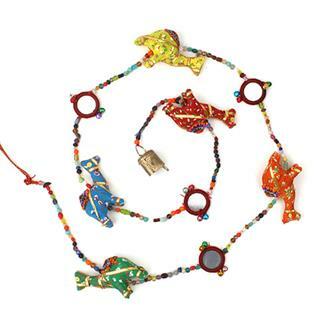 Each comes on a length of string covered in beads and pom poms and finished with a larger bell. 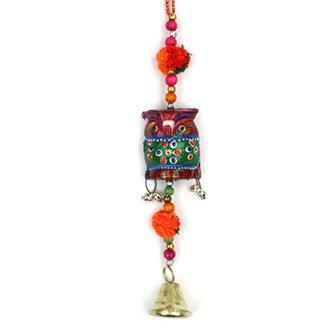 These hand painted single camel dangleys are adorned with beads a tinkling little bell. Great for a little decoration anywhere in the house or ideal as Christmas decorations on the tree. These lovely little owl charms are each adorned with brightly coloured beads and fabric. They come complete with a tinkling bell and make great little hanging decorations. 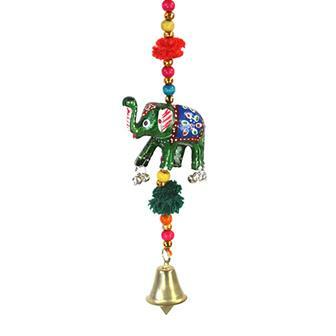 A weighty collection of painted elephants suspended on a rattan umbrella with each string adorned with colourful beads and finished with a simple metal bell. 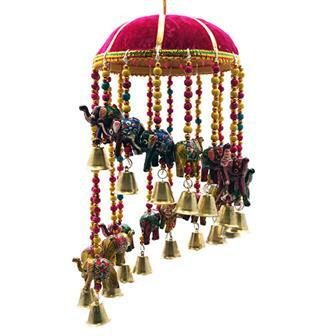 This delightful Indian mobile makes a gentle jingle when there is a light breeze. 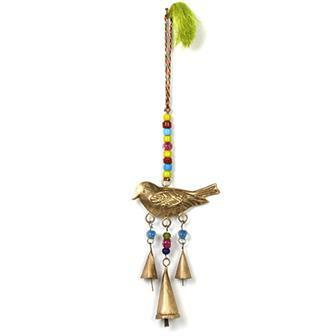 Sweet little windchime featuring a metal bird which suspends three rustic Indian bells, the item is adorned with glass beads and hung on a length of colourful nylon.